Beijing 2012: new Jaguar engines | What Car? Jaguar has revealed three new petrol engines, including one destined for the forthcoming F-type sports car and another that will bring four-cylinder power to the XJ luxury saloon. The F-types motor is a 3.0-litre supercharged V6, which produces 375bhp at 6500rpm and 332lb ft between 1800 and 4000rpm. Thats enough to put the new convertible sports car between the Porsche 911 Carrera and Carrera S for raw power, and it will have more torque than either of them. The 375bhp motor will be exclusive to the F-type, Jaguar says, but a detuned version of the same engine is being made available in the XJ and XF saloon, in conjunction with an eight-speed automatic transmission. The engine will produce the same torque, but a more modest 335bhp; it will replace the 5.0-litre normally-aspirated V8 petrol engine in the XF (not sold in the UK) and XJ. The final engine is a version of the Ford-derived unit thats also sold (in tiny numbers in the UK) in the Evoque. The 2.0-litre turbocharged motor produces 238bhp at 5500rpm and 251lb ft of torque between 1800 and 4000rpm and is designed to replace the elderly naturally-aspirated V6 petrol engine in XF and XJ models globally. An XJ model with this engine should go on sale before the end of the year. UK buyers arent offered a V6 petrol XF, but the four-cylinder replacement could make it here; Jaguar sources say the firm is considering introducing the model in the UK as a potential rival for BMWs turbocharged 328i. 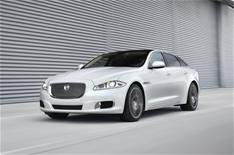 The disparity between petrol and diesel prices hasnt gone unnoticed, said a Jaguar spokesman. Theres no definite plan to bring it here, but theres no technical reason why it couldnt happen either. Jaguar is also using Beijing to show the XJ Ultimate, a model tailored towards Chinese customer tastes. It features a more luxurious rear cabin, a business table, bespoke champagne flutes and a champagne chiller, a leather-trimmed centre console and individual iPads for rear passengers.